Workers with the city of San Jose and Caltrans on Monday started clearing out a homeless encampment next to Highway 101 near Story Road in the South Bay city. Robert Handa reports. 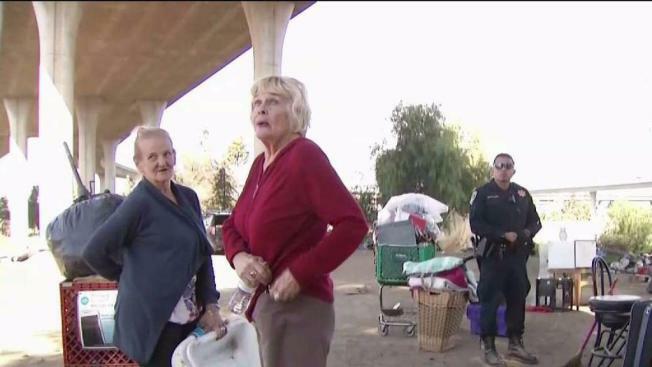 Workers with the city of San Jose and Caltrans on Monday started clearing out a homeless encampment next to Highway 101 near Story Road in the South Bay city. Before crews went to work, they were met by homeless advocates taking aim at Google. Advocates, who claim Google is getting a free ride from the city, want the company to be forced to help with the region's housing crisis. Pastor Scott Wagers, one of the organizers and an advocate for the homeless in the area for more than 25 years, led the protest that called for a better answer for "Silicon Valley's ongoing humanitarian crisis of housing and homelessness" than evicting the homeless from underneath the freeway junction. "I know about 80 percent of the people in this camp," Wagers said. "From 'The Jungle' sweep in 2014, these people moved to another strip of land in a cul-de-sac by McLaughlin Avenue to here. And now they'll be going back to that location, even though Caltrans put a wall up." The clean-up process is slated to take about one week. Crews will remove trash, hazardous materials and anything else left behind as well as fix the fencing and landscaping in the area all at the cost of taxpayers. The city of San Jose estimates that there are more than 4,000 people who live on the streets. Sherry Todd, who lived at the encampment being cleared out, said she'll pack up and move down the street until Caltrans is done cleaning. She said she'll then return because she has nowhere else to go. Caltrans spokesperson RocQuel Johnson said that a homelessness task force has been out at the site every day since notices of evacuation were issued to the homeless to help them find the resources that they need. The clearing efforts were supposed to start last month, but the agency has been working with state Sen. Jim Beall's office to provide extra assistance to those affected by the notices, according to Johnson.